This is the first matte powder I've purchased and is a life saver for preventing shine through out the day! I have the translucent shade and found that I did need to touch up over my t zone during the day.I was impressed that this powder lasted 4-5 hours before needing a touch up :) When I first used this powder I made the mistake of applying too much, and this made my face feel tight and cakey. A light swirl is all that is needed over your oily areas ! I love this pressed powder, I use the shade Peach Glow and it fits perfectly with my skin tone, it keeps shine away for 4+ hours in my experience. Tips: I use quick dabbing motions on my skin to apply this with a kabuki brush. I find this is the best way to really work the powder into my pores. Stay Matte is such a great powder for the price!! I alternate between this and Australis Fresh & Flawless which I also love. It keeps me nice and matte for most of the day (Sometimes I reapply as I have super oily skin), sets my makeup nicely and the smell is also quite nice!!! Will repurchase this forever! I have been a powder girl for my whole makeup life as I love the matte look, and this one was highly recommended. I first used peach glow but am now in love with transparent. Peach glow is slightly warmer but transparent goes with everything. These powders last a long time and are light and good coverage. However, I have recently tried another powder (Bourjois healthy mix) and have found it keeps me "staying matte" a lot longer than the Rimmel stay matte. The clear lid on the stay matte isn't completely reliable either, so I prefer to use it at home rather than taking it out and about. Tips: Beautyjoint.com and Asos sell it for about $8! Half the price of Farmers! I have the translucent version of this powder and OH my gosh the coverage is amazing. I pat it on my nose and under my eyes as these are the places my foundation doesn't tend to stick to - and it gives me all day coverage! It's light to wear and doesn't look cakey! It's quite easy to blend as well which really helps. Tips: Dab with a powder brush over areas you find foundation doesn't set to properly. This is perfection! I hate having a shiny face, I pop this on after my foundation and it takes all the shine away and stays that way all day. It doesn't cake, and it doesn't look powdery. Could not do my makeup without this! I'm thinking I will have to stock up in case they ever discontinue it. I don't really understand why people love this so much. I mean yes, its awesome because its one of the few pressed powders not to result in cakeyness with no powdery face but i didn't think it benefited my makeup at all. With or without this powder my makeup stayed the same, i don't think it prolonged the wear of my makeup, no coverage - i do get its not meant for that, didn't keep me matte all day. Basically, i could go without it.Still prefer my MAC MSFN. I bought this Pressed Powder a couple of weeks ago and I have become absolutely obsessed with it. Putting it on is literally my most favorite part of my make up routine. Rimmel have done it again! The powder looks soft and natural on my skin and lasts the whole day. I am a waitress at a very busy cafe/restaurant and at the end of my day long shift, I still look as fresh as when I put the powder on that morning! I am very impressed with this product and I would highly recommend it to anyone! Tips: Stay Matte Powder has great coverage capabilities so you don't need to cake it onto your face! Use a little bit for a full face of freshness! I brought this product a few months back because I was seeing everyone rave about it on youtube so I decided to try it. My skin only tends to get oily half way through the day and only in my t-zone and because of my job I don't really have time to duck away and touch up so after trying this for awhile I've noticed how it nicely it keeps my skin looking matte and fresh, even by 5pm! I love how cheap it is as well, definitely one of the best setting powders I have tried! I am a long time user of Rimmel and generally try most of their products based on my good experiences with theirs . 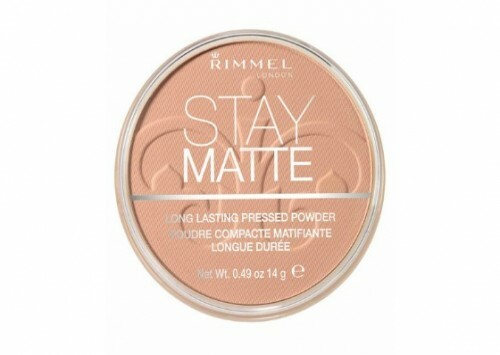 My powder had just run out when I saw the Rimmel Stay Matte range had hit NZ stores , so I purchased one . I love that they have a large range of shades , including ones pale enough for my skin . I also love the consistency and easy blending capability of the product . Not much powder needs to be used for a great finish . This product also provides great payoff , and lasts well throughout the day . It sets make up perfectly but is easy enough to remove at the end of the day .